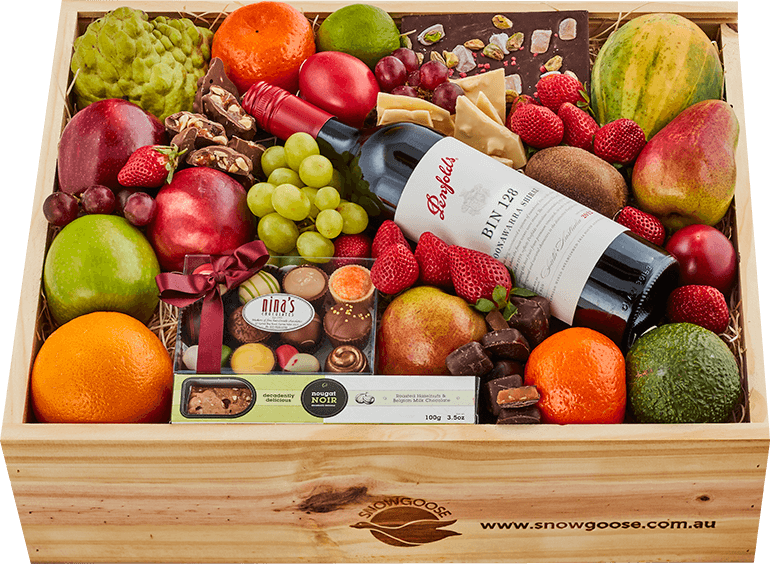 Snowgoose mixed fruit gift hampers have been surprising and delighting lucky recipients for more than 30 years. Colourful, aromatic and mouth-watering, our fruit baskets brim with Australia's finest fresh seasonal fruit and a selection of artisan produce from leading providores. 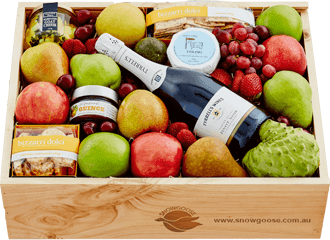 Every delectably different fruit gift idea in our online shop arrives beautifully presented in our iconic wooden Snowgoose box. Appropriate for every occasion, our deluxe fruit hampers give the precious gift of helping someone to relax and indulge in life's simple luxuries. 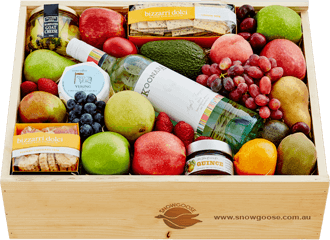 Over the years, we've perfected the art of gift giving, making it an enjoyable and satisfying experience for you to browse and buy online fruit gift baskets for every occasion. 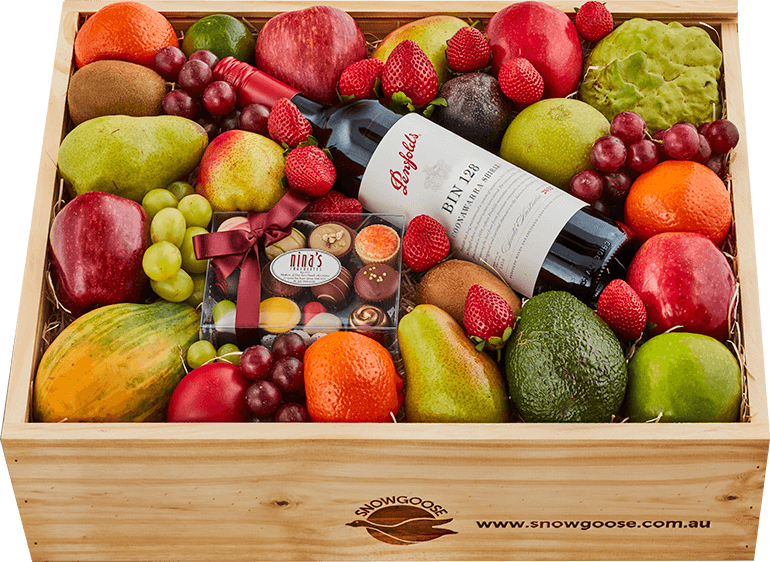 Our Fruit Gift Hamper Collection awakens and captivates the senses with Australia's finest fresh produce. 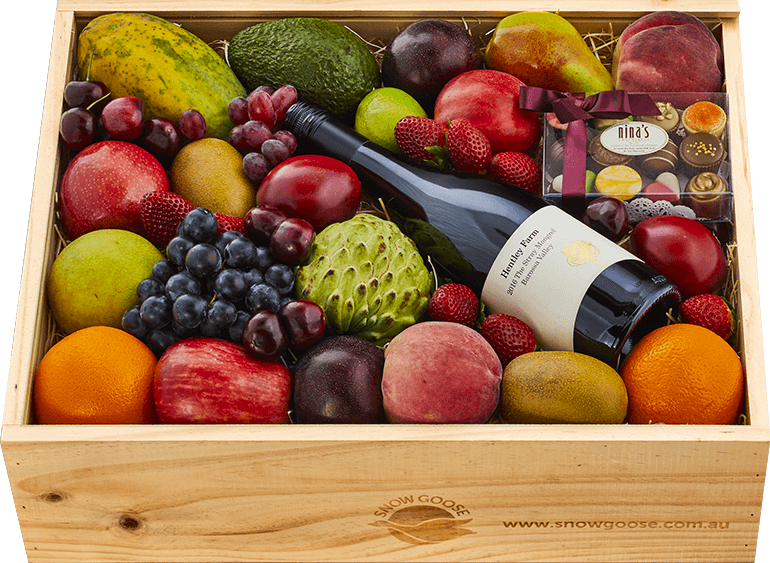 The foundation of our legendary fruit baskets is a bounty of Australia's finest and freshest fruit. 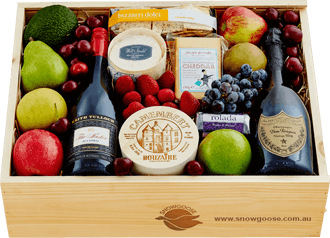 Add to this a choice of iconic Champagnes, rare wine, farmhouse cheese or artisan chocolates and you have a gorgeous choice of fruit hampers online that guarantees to impress! 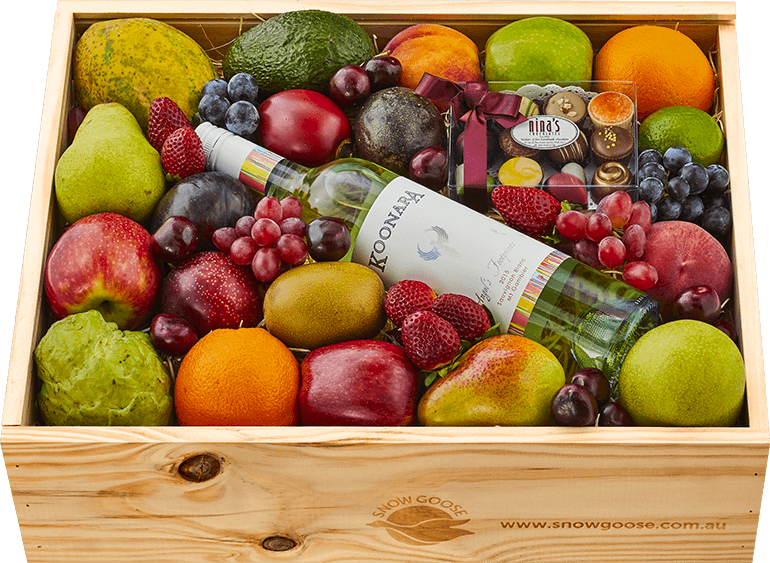 At Snowgoose, we believe that the quality of produce you give reflects how you feel about your recipient. So, we're passionate about delivering only the finest quality, flawless and most flavoursome fresh fruit in our hampers. We pick our fruit at the precise point of perfection and hand pack it into your extraordinary gift experience. How wonderful it is to know your recipient will be relishing perfect fruit that's been on the tree less than 48 hours beforehand! John Antico AM has been growing, buying and transporting fruit for 60 years. So, it's no surprise he knows which fruit is the finest. 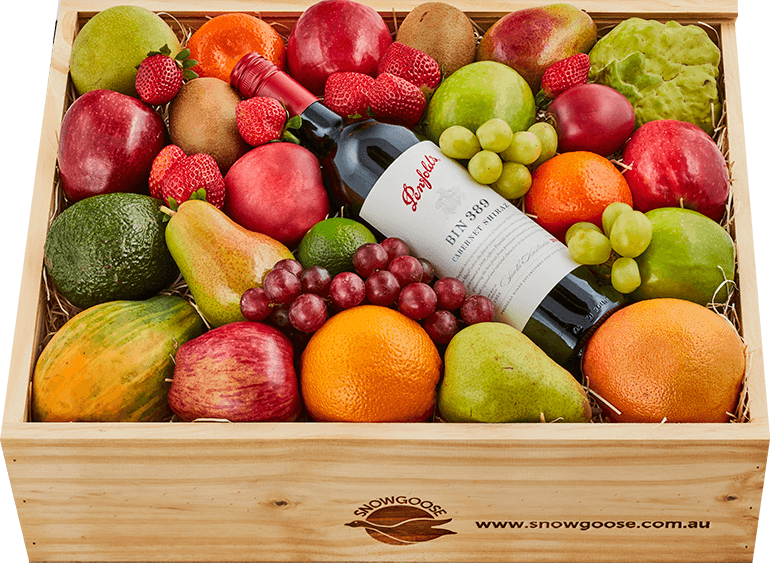 John's Snowgoose fruit is celebrated for its flawless skin, large size and just-picked orchard aromas and flavours. His passion for unrivalled quality, authentic food is reflected in the beautiful produce he carefully moves from orchard to doorsteps across Australia, ensuring recipients indulge in something truly special. To Snowgoose, 'authentic produce' has significant meaning. We travel the continent to unearth Australia's finest quality and most delectable best-kept secrets. And we find them in unusual places. Our artisans and providores are small-batch producers who live and breathe the art of taste. Hand-foraged or home-grown ingredients fuse with culinary expertise to produce undeniably delicious aromas, textures and flavours. From orchards and farms to home kitchens and boutique vineyards - we're proud to bring your recipient treats that awaken the taste buds like never before. 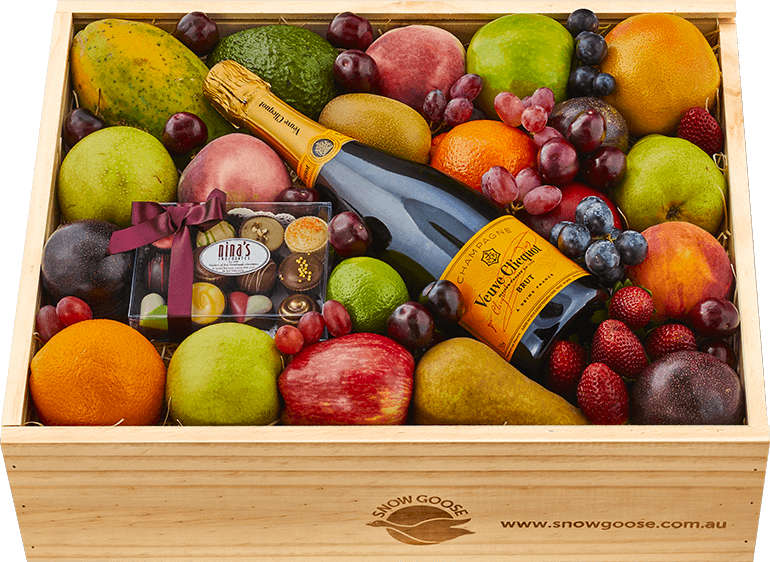 In today's crazy-busy world, you don't need an excuse to send a delectable fruit hamper gift! Recently, we've seen an enormous increase in 'just because' hampers, celebrating friendship and love. Our fruit baskets help to create delicious events, from picnics, boating and date nights to Oscar® evenings in front of the TV - they're the perfect excuse to bring people together and share our artisan delights. 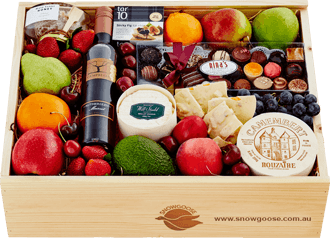 As the pinnacle of Snowgoose’s gift experiences, this Grand Reserve hamper arrives brimming with artisanal produce that's simply the best of the best. 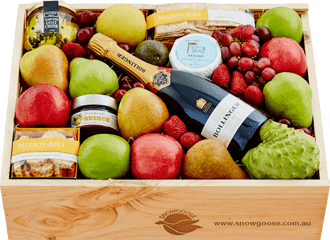 The highlight of this hamper is an abundance of our signature orchard-fresh fruit. Handpicked at the point of perfection, every flawless piece delivers orchard aromas and mouthwateringly fresh flavours. To add to this, we picked the best of the best - Keith Tulloch 'The Kester' Shiraz and Dom Pérignon! Only a limited quantity of these reserve wines is made available, making them a rare gift to receive. Farmhouse Oak Smoked Cheddar, camembert and Will Studd's decadently creamy Brillat Savarin cheese complement our choice, tasting extraordinary with Rolada and handmade biscuits from Bizzarri Dolci's kitchen. It's a true gourmet Gift of Taste that guarantees to seriously impress. This indulgent hand selection of artisan specialities takes taste buds on a heavenly journey of discovery. Beginning with a banquet of our famous seasonal delights, your recipient will savour the orchard aromas and mouthwatering flavours of flawless premium fruit, plucked from the trees just 48 hours beforehand! In South Australia's Coonawarra, we discovered the Reschke family's Koonara Vineyard. Only a limited quantity of selected Koonara Angel's Footsteps Sauvignon Blanc is released to the public, making this wine a rare treat. Offering the palate a touch of guava with crisp apple and gooseberry notes, it's the perfect cool climate wine to complement Yarra Valley Dairy's buttery Yering™ and Meredith Dairy's addictive Marinated Goat Cheese. Together with Bizzarri Dolci's handmade Peppery Cheddars and Lavosh and The Fine Cheese Co. Damson Paste, this generous gift ensures your recipient is fully equipped to unwind and indulge. In South Australia's Coonawarra, we discovered the Reschke family's Koonara Vineyard. Only a limited quantity of Koonara Angel's Footsteps Sauvignon Blanc is released to the public, making this wine a rare gift to complement our just-picked fruit. In South Australia's Coonawarra, we discovered the Reschke family's Koonara Vineyard. Only a limited quantity of selected Koonara Angel's Peak Coonawarra Cabernet Sauvignon is released to the public, making this wine a rare treat to complement our just-picked fruit. To add to the celebration, we've selected a bottle of iconic Veuve Clicquot Brut Yellow Label, crafted using grapes from 50 to 60 different crus. Displaying hints of blackberry, white cherry, biscuit and honey, it’s the ideal accompaniment to our signature fruit. There's simply nothing like giving the gift of taking time out to indulge, and that's exactly what they'll do with this luxurious champagne gift hamper. Sliding open the elegant box, they'll be greeted with a colourful display of our flawless fruit, famous for their orchard aromas and mouth-watering flavours. They'll also discover farmhouse cheeses, including Yarra Valley Yering™, revered by cheese enthusiasts for its rich and buttery taste - delicious with The Fine Cheese Co. Damson Paste, the handmade lavosh and peppery cheddars. The prestigious Bollinger Special Cuvée delivers a subtle palate of pear, brioche and spicy aromas - the perfect complement to this heavenly biscuit, cheese and fruit selection. Our sommelier has selected the Stray Mongrel From Hentley Farm - with extremely lifted and pretty nose with an abundance of aromatics including rose petal, turkish delight, red berries, wild fennel and pepper. 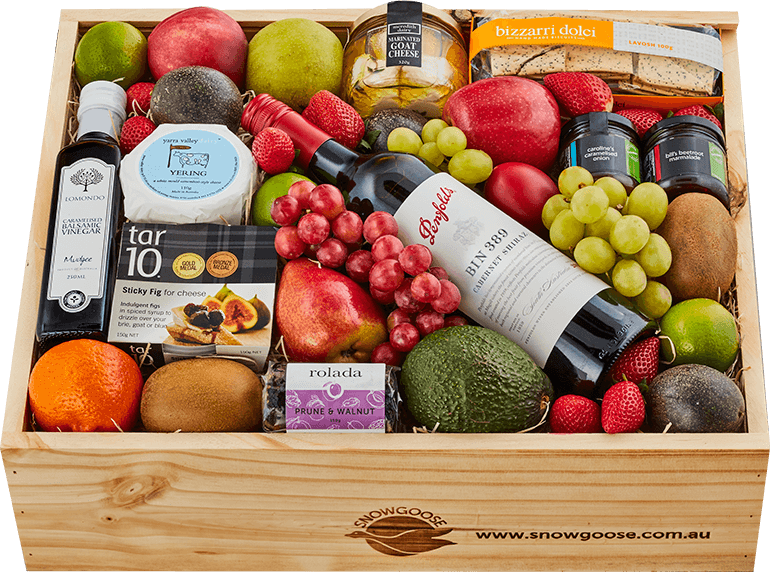 This lavish hamper is the ultimate gourmet experience to impress those who crave sweet luxuries, yet still enjoy some savoury indulgence along with Rutherglen Muscat Wine. A bountiful arrangement of legendary fruit greets them with fresh orchard aromas and spectacular festive colour. Our sommelier has selected Rutherglen Muscat Wine - the perfect wine with clean and salving aftertaste and just right sweetness to savour with the outstanding camembert and Will Studd's decadently creamy Brillat Savarin cheese. In addition, Nina's master chocolatiers have put together a personal selection of their rich chocolates, handcrafted with top-notch Belgian couverture. Together with raw Maya Sunny Honey Macadamia Crunch that's 100% raw yellow box honey with raw macadamias, this luxurious indulgence is a joy to give and heavenly to receive. Celebrate every special occasion with this extravaganza of the finest gourmet appetisers. Ready to serve right out of the exquisitely presented hamper, the banquet begins with our fresh and flawless in-season fruit, plucked from the trees at the point of perfection. Giving the rare gift of helping someone take time out to indulge, we've included a bottle of Penfolds Bin 389. BIN 389 is matured in the same barrels that held the previous vintage of Grange and exemplifies the judicious balance of fruit and oak. It's the ultimate accompaniment while relishing the rich and buttery flavours of Yarra Valley Dairy's artisan Yering™ cheese. Tasmanian Gourmet Kitchen's savoury beetroot marmalade and caramelised onions taste exceptional spread with the decadent Goat's Cheese on Bizzarri Dolci's Lavosh. Together with divine Sticky Fig and a drizzle of Joseph Olive Oil, this extraordinary Gift of Taste sends your thoughts and wishes in a delectably different way. 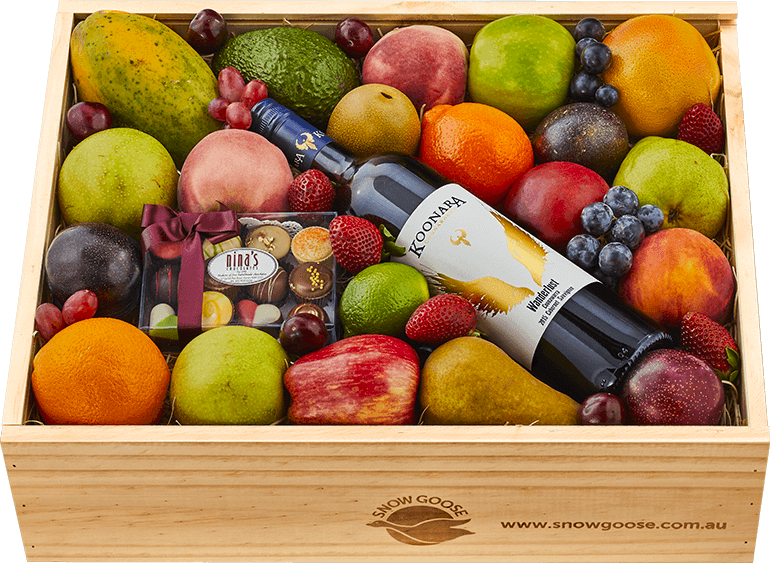 This irresistible collection of fruit, sweet artisan specialities and exceptional red wine is guaranteed to be a winner. Greeted by a colourful display, each recipient will indulge in the sensational orchard flavours of the finest fruit, plucked from the tree just 48 hours beforehand! We have chosen Penfolds Bin 128 to complement the sumptuous produce. Bin 128 comprises fruit sourced from the unique terra rossa soils of Coonawarra, a region that exemplifies the perfume, transparency and seductive nature of cool-climate red table wines. Nina's master chocolatiers have also put together a personal selection of their handcrafted Belgian chocolates and a generous wrapping of White Chocolate Honeycomb that feasts the eyes as well as the taste buds. It's an unforgettable gift that is truly as much a joy to give as it is to receive. This beautiful hamper offers the rare gift of slowing down for a moment to indulge in delectably simple luxuries. To begin the experience, we've selected a bounty of our signature orchard-fresh fruit. Handpicked at the point of perfection, every flawless piece delivers orchard aromas and mouthwateringly fresh flavours. We have chosen Penfolds BIN 389 Cabernet Shiraz to complement the sumptuous produce. BIN 389 is matured in the same barrels that held the previous vintage of Grange and exemplifies the judicious balance of fruit and oak. Guaranteed to impress, it delivers your thoughtfulness in the most memorable way.